I know exactly what it would look like. An eau de nil colour, butter-soft leather, tailored a little like a suit jacket. In fact, if anyone comes across a jacket matching this description, please, please let me know. Then I saw this from Zara. Almost perfect; albeit collarless, a darker tan, a bit more casual and more expensive than I was looking for. 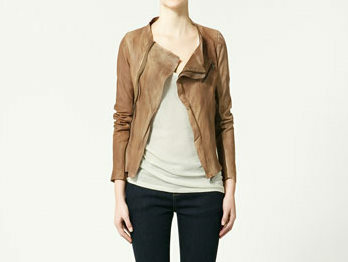 But still a lovely jacket...it's out of stock now I think. Oh well! Perfection never exists in reality, but only in our dreams.